From Napier Enterprises is the Sportz Dome to Go Tent, specially designed for hatchback and station wagon cars and small SUVS. 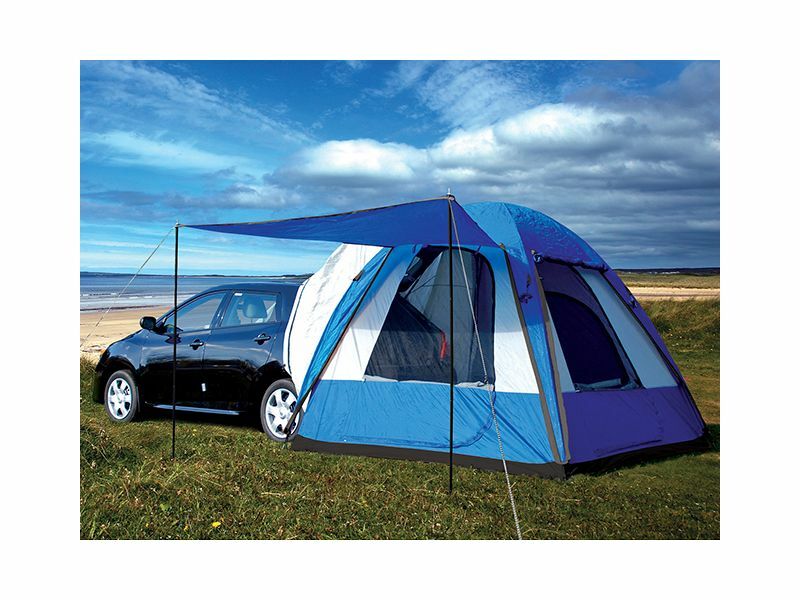 This car and suv tent features an easy to assemble clip design for quick set ups. The spacious Sportz dome to go tent interior sleeps 4. A fully detachable sock wraps around the cargo area of your vehicle, allowing for easy access to storage or as an additional sleeping area. The Napier Sportz Dome To Go Tent measures 8.5'x8.5' providing plenty of space to sleep 4 adults. It includes its own carry bag for easy storage as well as rear loft and mesh pockets for additional storage. Made by Napier Sportz Tents. All Sportz Tents have a one year warranty period from the time of purchase. In order for your warranty to be valid, you must (1) mail or email your Warranty Card to Napier Enterprises within thirty (30) days from the date of original purchase; (2) have your proof of purchase (receipt from the place of purchase) to prove the date of purchase.